The biology major will research the genetic effects of prenatal exposure to SSRIs, a type of anti-depressants, during her year in the Netherlands. When Juliette Rando '15 was 13 years old, she visited the Vrolik Museum in the Netherlands. It is Amsterdam's version of Philadelphia's own Mütter Museum with its 18th-Century medical collection of pathological specimens, odd skulls and bones, and other curiosities. Ever since that trip, Rando, a native of Sharon, Mass., says she has been enthralled with genetics research. Fittingly, as she graduates from Haverford College with a degree in biology and a minor in neurosciences, Rando will spend the next year in the Netherlands conducting genetics research as a recipient of a 2015-16 Fulbright U.S. Student Award. "The Netherlands has served as a sort of romantic framing of my pathway to becoming a scientific researcher," she says. Rando will work at Radboud University Medical Centre in Nijmegen. 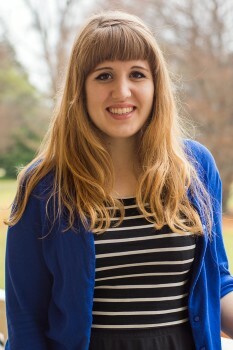 There, she plans to study with Associate Professor Judith Homberg and her behavioral neurogenetics group and research the genetic, morphological and behavioral effects of prenatal exposure to selective serotonin re-uptake inhibitors (SSRIs), a class of anti-depressants. SSRIs are often prescribed to the 7 to 13 percent of pregnant women who suffer from depression. While the drugs improve the mood of the mothers, SSRIs can enter the fetal bloodstream through the placenta. This results in an increase in serotonin levels in the fetus. More serotonin improves the mood of adults, but in the fetus, it has the opposite effect, increasing anxiety and depression—a phenomenon known as the SSRI paradox. Using rats as subjects, Rando will study how SSRI exposure affects gene expression and whether it has an impact on myelin, the fatty material that insulates most neurons. "The results of this investigation will elucidate the paradoxical consequences of maternal SSRI use on both a genetic and a behavioral level," Rando says of her planned Fulbright research.